The Economic Policy Institute has just issued a provocative new report, “Raising America’s Pay: Why It’s Our Central Economic Policy Challenge”. 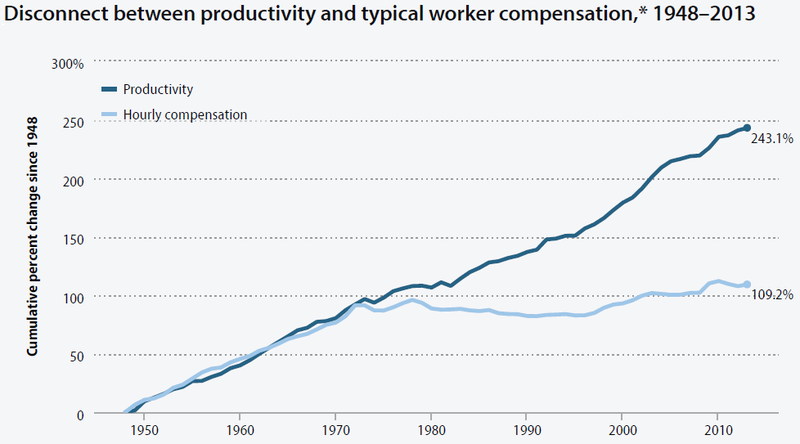 It is based on the now widely accepted view, as summarized in the chart below, that wages for the typical (i.e. median, not average) American worker have been stagnant since the early 1970’s, even though productivity has continued to increase at its historical rate. The slumping of hourly wage growth for the vast majority explains the overall trends in income inequality. Wage stagnation stalls progress in reducing poverty. Wages are the root of economic security for the vast majority. This includes the fact that Social Security benefits depend upon wage earnings before retirement. Then they ask: “Why has wage growth faltered for the vast majority, and what can be done?” Here is where the report becomes controversial! Falling top tax rates have increased the income share of the top 1 percent. The Federal Reserve has prioritized low rates of inflation over low rates of unemployment in recent decades and high unemployment suppresses wage growth. The erosion of the inflation adjusted minimum wage and the share of the workforce represented by a union explain much of the entire rise of wage inequality over this time period. The authors are completely correct that stagnant wages for American workers is a critical, even “central,” problem facing the economy at the present time. The question, of course, is how to address this problem most effectively. In my opinion, the authors have completely neglected to take into account how a faster rate of economic growth would contribute to a solution of the problem and how this could be accomplished. I will address this question in my next post in a couple of days. They conclude by saying that this report is only the first in a multiyear research and public education initiative of the EPI. We have a lot to look forward to! This entry was posted in boosting economic growth, economic growth, Economic Policy Institute, Economy, Elise Gould, globalization, Heidei Shierholz, Is capitalism in crisis?, Jack Heidel, jobs, Josh Bivens, Lawrence Mishel, raising America's pay, technology, What is America's biggest problem? and tagged economic growth, economy, globalization, jack heidel, raising America's pay, tax reform, technology by jackheidel. Bookmark the permalink.